Custom scientific illustration of skin protection created for the Priori Skincare Company to explain how different environmental sources cause skin damage, and show how their product helps prevent and reverse this damage with (TPF) or Total Protection Factor™. This illustration was included in the article entitled The Skin Health and Beauty Pyramid: A Clinically Based Guide to Selecting Topical Skincare Products, published in the Journal of Drugs in Dermatology, April 2014, Volume 13, Issue 4. This image had several specific elements that our client wanted to depict. The first set of environmental sources of skin damage are UVA rays, UVB rays and infrared rays from the sun. The second set of environmental sources of skin damage are cigarette smoke, ozone and air pollution. Then we needed to show how these damage sources cause the formation of toxic free radicals within the skin. Precise graphic representation of the various protection barriers show how effective they are at preventing different degrees of skin damage. 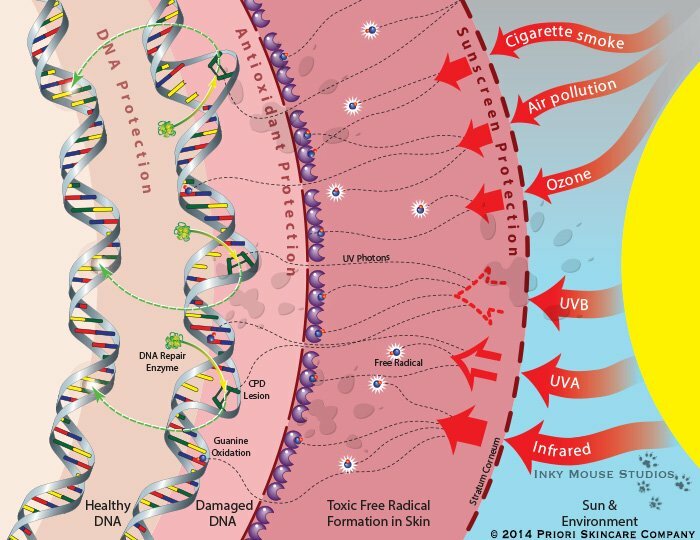 These protection barriers can prevent penetration of the skin with an SPF sunscreen, scavenge toxic free radical molecules with antioxidants vitamin C and vitamin E before they cause damage to the DNA structure, and even shield DNA with DNA repair enzymes which correct crosslink DNA damage caused by free radical molecules that get past the first lines of defense. This was an interesting image with a lot of different elements which needed to be cleanly and clearly illustrated for consumer educational purposes. The end result was a client who was very happy with the finished image that we created from his concept sketch.